Ready to Bag Some Serious Fish? Welcome To Bag´Em Fishing Charters - Fishing Charters in Tampa, Florida. Welcome to Bag’em Fishing Charters, where we offer light tackle and fly fishing adventures to anglers of all skill levels. Your guide is a Florida native and has been fishing the waters of Central Florida for over 25 years, specializing as an Inshore Fishing Guide. Captain Bucky’s goal is to provide a safe and fun filled experience as well as share with you some of the knowledge he has acquired. Let’s put our skills together and make a memory that will last a lifetime! With an experienced Inshore Fishing Guide you will have to chance to target Redfish, Speckled Sea Trout, Black Drum, Snook, Tarpon (seasonal), and many other variety of fish these water systems have to offer. You will also be able to witness some of the exciting and wonderful wildlife including alligators, manatees, dolphins, and countless exotic and native bird species. Capt. Bucky is an USCG licensed and insured guide. He will provide all tackle, bait, photos, and enough water for everyone. He will be taking you fishing on his 17 foot Mitzi Skiff, which can comfortably fish three passengers, the Captain, and still be able to float in less than a foot of water. That means that we can reach fish where others dare not venture!! A Yeti Tundra 65 cooler has been mounted on the bow to act as a casting platform as well as a cooler. Capt. Bucky is a conservationist and believes in catch and release. On occasion he will gladly clean and bag your catch per request. Thanks for taking a minute to look through this website. If you’d like to inquire about guided fishing charters in Tampa Bay or adjacent bodies of water please call (407) 977-7650, text, or fill out the contact form below, and I will get back to you as soon as I am off the water. Thank you! My wife and I were flying down to Florida for a long weekend. I started googling fishing guides and quickly became overwhelmed with all the options out there. Coming from New Jersey I did not have any refferals to go from. I stumbled upon Captain Bucky’s site and decided to book a trip with him. Once I received a phone call from him I knew I was in good hands. 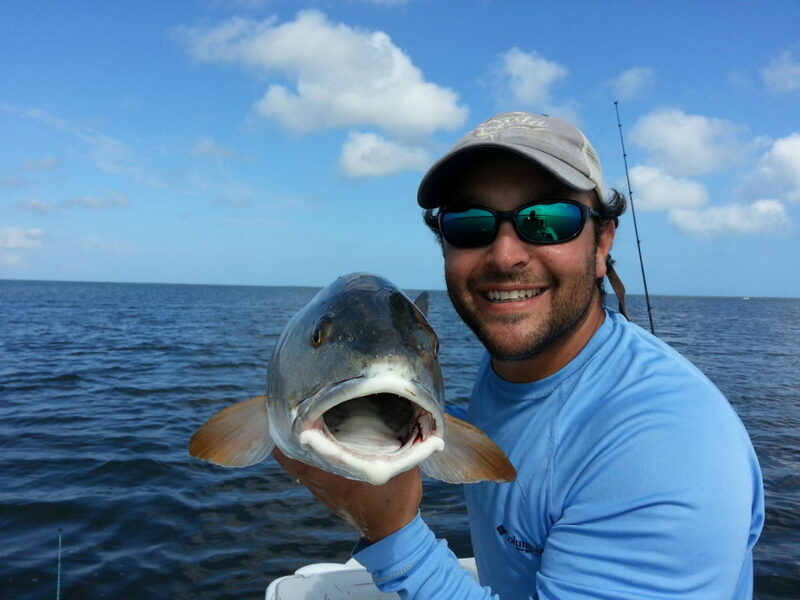 He definitely knows his stuff when it comes to redfish and how to find them. Our arms were sore from catching fish all day! He was also very accommodating to me and my wife who was 7 months pregnant. Thanks captain Bucky!